Explore 4 of London's fascinating attractions with the BIG London Attraction Ticket. Valid for up to a month, this ticket allows you to visit these 5 attractions on your own time, at your own pace. 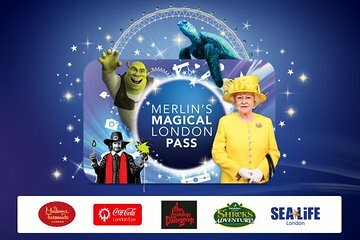 The ticket is valid for the DreamWorks Tours Shrek's Adventure, The Coca-Cola London Eye, the SEA LIFE London Aquarium and, London Dungeon and the iconic Madam Tussaud's wax museum. Between these 4 experiences, you will spend some time as an ogre, see all of London from the top of the world's largest observation wheel, see wax likenesses of all your celebrities and come face to face with a rich array of sea life. The BIG London Attraction Ticket includes access to the following attractions. Exchange your voucher and start your adventure at Madame Tussauds, the rest of the exploring is up to you. All attractions are located in central London and are easy walking distance from an Underground station. Walk the red carpet at the legendary Madame Tussauds London and meet the world’s most famous stars from Hollywood to Bollywood, and The Royal Family to Rock Royalty. With over 30 wax figures, there’s also a nostalgic taxi ride through 400 years of London’s history and a Marvel Super Heroes 4D movie adventure. © & TM Lucasfilm Ltd. 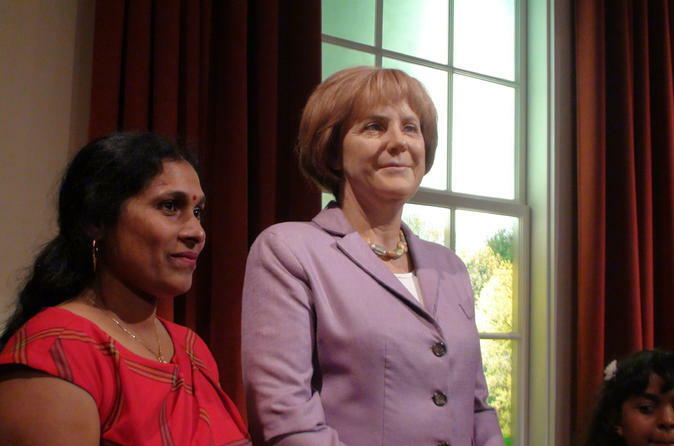 Images shown depict wax figures created and owned by Madame Tussauds. Admire the many strange, beautiful and fascinating creatures of the deep as your journey through this amazing underwater world. Prepare for astonishingly close views of everything from Gentoo penguins to tropical sharks. Star in your very own hilarious, madcap adventure to the kingdom of Far Far Away, surrounded by Shrek and his friends. Board a magical ‘DreamWorks Tours’ red bus driven by the mischievous Donkey, where chaos and calamity are sure to follow. Explore the fantasy worlds of Far Far Away to meet Princess Fiona, Puss in Boots and ‘Gingy’ the Gingerbread man. Rumpelstiltskin, wearing his ‘angry wig’ will do all he can to disrupt your tour and stop your return to London. At 442 feet (135 meters), the Coca-Cola London Eye is the world’s tallest cantilevered observation wheel, with 20-mile (40 kilometer) panoramic views on a clear day. The gradual rotation in one of the 32 high-tech glass capsules takes approximately 30 minutes and offer spectacular views of London and its famous landmarkSee Big Ben, Buckingham Palace, St Paul’s Cathedral, Westminster Abbey and Trafalgar Square. Conceived and designed by Marks Barfield Architects.‘Coca-Cola’, the Dynamic Ribbon Device and the design of the ‘Coca-Cola Contour Bottle’ are registered trademarks of The Coca-Cola Company. The London Dungeon is a must-see visitor attraction that brings together an amazing cast of theatrical actors, special effects, 360 degree stages and scenes in an exciting walk -through experience where you will hear, touch, smell and feel over 1000 years of history moving from show to show. It’s funny, scary and keeps you on the edge until the very end! Please note: Madame Tussauds will be your first attraction booked with timed entry and cannot be changed. Your other attractions timed entry can be pre-booked through the supplier portal, refer to voucher for details. Alternatively your other attractions timed entry can be booked at Madame Tussauds - first attraction booked. Please note: Operating dates, times and closures vary for each attraction. Please verify schedules prior to booking. best deal with family ! El museo de cera es excelente, se puede tomar foto con todos los personajes, no dejen de entrar a una sala de animación en cuarta dimensión es muy divertida, El Sea Life tiene animales de muchas especies, me encanto ver a los pinguinos, El London Eye, tiene una vista espectacular sobre el río Tamesis y el centro de Londres y solo si tienen hijos menores de 8 años les recomiendo Shrek s , porque para mi fue super aburrido, se me hizo eterno. Aufgrund des Tickets konnten wir uns wirklich Wartezeit bei Madam Tussauds sparen, aber beim London Eye leider nicht. Shreks ha ben wir nicht gebraucht. Alle drei besuchten Attraktionen waren sehr beeindruckend. Nous avons certainement eu de la chance car pas de file d'attente pour nous. Juste un petit soucis c'est qu'au musée de Mme Tussauds ils ne nous ont pas donné les tickets pour les suivants visiblement ce qui été normal mais à la London Eye ils ne le savaient pas ce qui nous a fait perdre un peu de temps mais ce n'étais pas la mort non plus. Avec beaucoup de chance nous somme tomber sur une personne qui parler français et qui nous a bien aider. Par contre si on ne parle pas un mot Anglais le musée de Shrek est super long et incompréhensible. Mais cela reste une expérience inoubliable. Niveaux prix on peux également acheter les billet sur place pour 65 livre les 4 entrées ce qui reste correct malgré tout. Fue todo un acierto pillar las 4 entradas conjuntas!!! si las compraba en Londres directamente en taquilla, costaban super caras! 40 libras madamme tussaud, 35 aquarium, London eyes otros treinta y pocos y el sreck, sobre las 30 libras! carísimo!!!! yo cpmpré las 4 por 62. Me sorprendión el madamme tusaud, que no me hacía ilusión verlo, pero como venía incluida con las demás, fui. al final fue lo que más me gustó de las 4 cosas yo ya había montado en London eyes anteriormente.